Today, on the 29th of August 2018, a number of human remains from the German colonial period were returned to a high ranking delegation from Namibia. The event took place at the French Cathedral in Berlin’s „Gendarmenmarkt.“ The human remains, 27 skulls and one scalp that have been kept until now by several different institutions in Germany, derive in part from the victims of the Herero and Nama genocide that took place between 1904-1908. We know for a fact that women from the communities who were nearly annihilated by the Germans were forced, while imprisoned in concentration camps, to scalp the insides of the skulls of their loved ones with glass shards in order to ready them for shipping to Germany for the purposes of racist research. 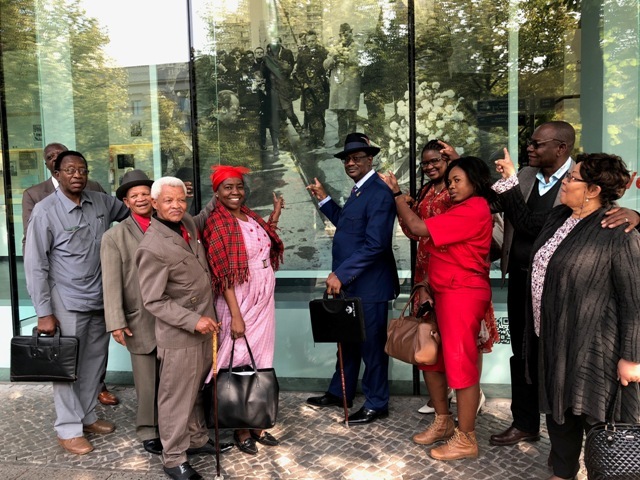 The nationwide Nongovernmental Alliance „No Amnesty on genocide“, who have as a whole been explicitly barred from entering the memorial service, protest strongly against the fact that the government have still not offered an apology to the Herero and Nama people for the genocide committed against them. It is an insult to the descendants of the murdered that the government cannot accept its historical responsibility even in the face of the abused victims of German racial delusion. Berlin: Kunsthaus KuLe, Auguststraße 10, 19 Uhr, opening of the Black Berlin Biennale with Herero and Nama activists in attendance.